One upon a time almost everyone or their mother had a Diane Von Furstenberg perfume on the vanity- Tatiana . Named for her daughter it was a big, beautiful floral. I am quite sure The Mom still has a bottle somewhere. 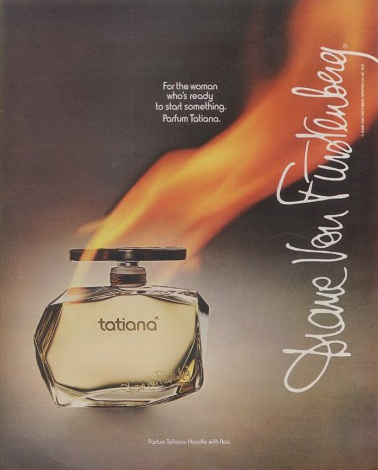 DVF was huge then and her perfume even bigger. There was also a killer makeup line and more fragrances. 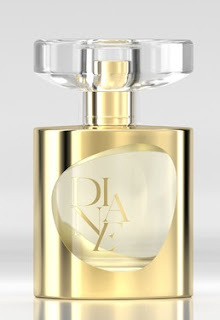 Then the luster faded some, the perfume was around but not as big a deal and we didn't hear as much about Diane. 10 years ago or so her star rose high again, deservedly so. She's a force in the fashion world not just for herself but others. And now we have a new fragrance from her - Diane. A few details emerged this week via WWD on the scent which will not launch until October. What I've read gives me great hope. First off it's created by Aurelien Guichard, well loved among the perfume fan base and the mastermind behind such greats as Bond No 9 Chinatown and Robert Piguet's revamped Visa and new Futur and Calypso fragrances. Also the two notes ,or elements as she calls them , that Diane stressed the scent have are frangipani and violet. Since I love those two notes very much, this is sounding good. DVF says she wants a fragrance that is " powerful and seductive, without being aggressive" and to be able to put " the power of wome in a bottle" . The scent is considered a woody floral. In the US look for it at Bloomies, Sephora and Nordstrom exclusively this fall. Summertime is flip flop time. There's a million kinds out there but Smushees are a bit different. These have a cushioned footbed that feels kind of like a bean bag for your feet as they have polystyrene micro-beads in there. Super comfy and soft. The outsole features Smartdog's TPR outsole, and is lightweight but hard so you can wear them in the yard . 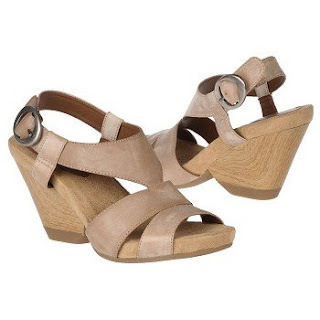 If you hit the site, they have a great shearling flip flop too . I've been needing a new pair for awhile and they are on sale. If you've always wanted to personalize your own bath products, here's your chance to get creative. Bath & Body Works is giving you, their fans, the opportunity to put your own spin on their PocketBac Hand Gel Sanitizers with the myPocketBac Design Contest. Bath & Body Works is inviting you, the consumer to log on to http://www.mypocketbac.com/ to customize yuor very own PocketBac labels through June 9th. The winning designs will be chosen by fan popularity, allowing Bath & Body Works customers to select the design that will end up on shelves. New winners will be selected this month AND next month, doubling chances to win. PS- shown are some of my Pocket Bacs including new patriotic themed ones. The S'Mores, particularly, is really nice. I haven't designed my own yet, but am going to give it a whirl soon. Good luck and hey, let me know if you win. After writing these up for my Lucky Alpha Shoppers page , I thought I'd share here too. 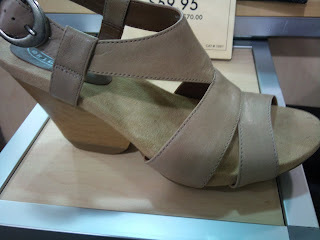 These very cute ( I think) sandals are from Dr. Scholls. Yes the Dr. Scholls of wooden sandals of yore ( still available, too). Hey they even have a wood like heel. But these are right on trend , not what you think of with Dr. Scholl's , right ? I never would have guessed the brand without the signage. You can see a thick cushioned footbed there and that's what sets these apart, making for comfort and style. I haven't bought these- yet. The sandal list is long so I'm still deciding, but since I originally saw them in April and they are still on my mind, it's looking more and more like a purchase. Called Women's Wonder and at DSW for $ 59.95 and also at http://www.drschollsshoes.com/ where there are quite a few other stylish but comfy options. The big winner- Gucci Guilty. They took the CEW award last week now 2 Fifis. Not my choice but I apparantly am in the minority here . I am thrilled to see Tom Ford Azure Lime get a win, and also Balenciaga Paris. Both well deserved. Bath and Body hit a home run with their men's lines last year and picks up a Fifi for it also. Mary J. Blige and Carol’s Daughter. This award, presented by the Foundation’s Board of Directors is to honor a celebrity who has embraced and promoted the world of fragrance over a period of time. It celebrates the ongoing success and support given by the celebrity to the industry and therefore attracting consumers to the category. 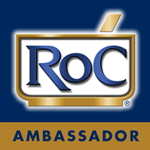 Selected by the Foundation’s Board of Directors, this award recognizes a celebrity whose very first fragrance has enjoyed instant success with the consumer and brought recognition to the fragrance category. -HERVE LEGER HOMME – AVON PRODUCTS, INC.
Fall 2010 Top Scorer: Amanda Markey, C.F.S.S. Nordstrom, Ross Park, Pennsylvania. Spring 2011 Top Scorer: Nicole Maki, C.F.S.S. Nordstrom, Mall of America, Bloomington, Minnesota. MAC Viva Glam & Lady Gaga " Glam This Way"
MAC and Lady Gaga have teamed again for “Glam This Way,” the campaign that puts the power of the M·A·C AIDS Fund into the hands of M·A·C’s fans and helps them further raise awareness of HIV/AIDS among those in their own social networks. · The more each user shares the VIVA GLAM message, the more prominent your image within the circle and the larger your “Total Glam” becomes. Lady Gaga will donate $1 from the purchase price of each special edition album bought in North America via http://www.ladygaga.com/ to the M·A·C AIDS Fund, supporting men, women and children around the world affected by HIV/AIDS. Part of Elizabeth Arden's summer line, Bronze in Bloom, is this super new coral blush called Pure Finish Mineral Cheekcolor in Sun Kissed Coral. It's a mineral solid that you shave off as needed. The color looks much brighter in the pan than on your skin. It goes on a sheer and is a warm light coral for a natural flush with no visible shimmer but it's not flat either. It also comes with the tiniest kabuki brush I've ever seen that also fold open to make a bigger brush. The brush is not the softest, ones included in compacts rarely are but it sure is cute. 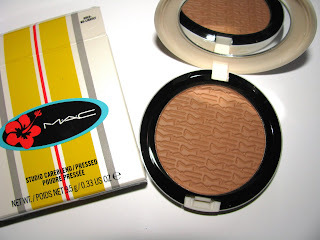 This is great to complement your summer looks and great if you want color but not bronzing. Mario Badescu Summer Shine Body Lotion isn't new but is a new find for me. Thanks to The Makeup Show where I discover so many products, I've fallen for another Badescu product. Summer Shine imparts a nice bit of shimmer . It seems many shimmer lotions I try really aren't noticeable. This is, but is still subtle. It's perfect for a nice highlight to warmer weather's bare skin and also for doing some leg contour. It's moisturizing, but light and has a great coconutty scent. Part of the soon to be here MAC Surf Baby line are two new Studio Careblend Pressed Powders . Both have color to them for bronzing and are embossed. Gold- Go-Lightly is shown here and is a mid tone golden tan brown or what I would call medium deep and has no shimmer. Lush- Light Bronze is a mid tone rosy pink brown. 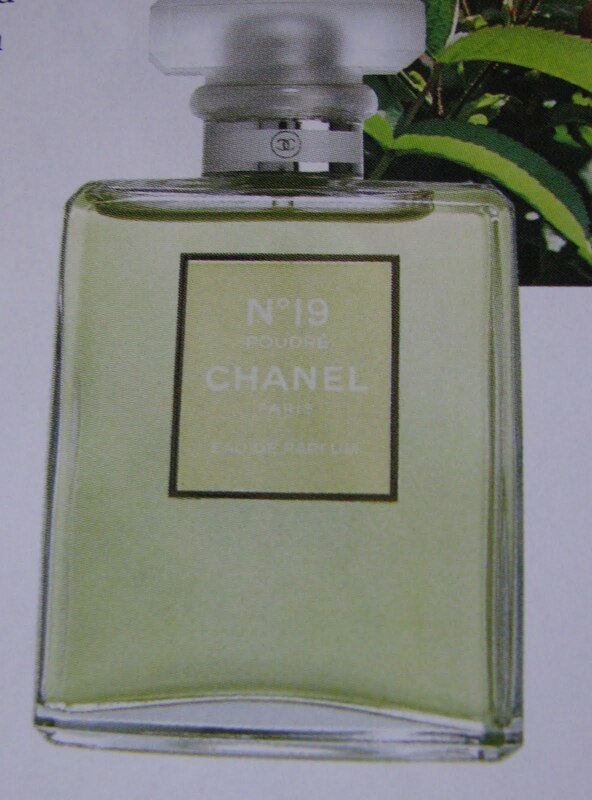 New fragrances by Chanel master perfumer Jacques Polge this fall will be Jersey, an addition to the Les Exculsifs line and Chanel No. 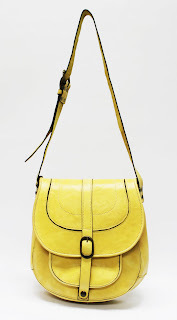 19 Poudre, an iris based update of the iconic No 19 ,according to an interview in Women's Wear Daily. Now any re-working of a fragrance as vaunted and beautiful as No. 19 is scary to be honest, but we can be happy that it is in very good hands with Mr. Polge. He is trying to recreate what was done 40 years ago with Iris, artisan wise and trying new things as well. I look forward to smelling this new creation come this fall. Photo: Mr. Polge in his lab and perfume bottle via WWD. The prestigious CEW awards were handed put yesterday. I have to say many of the picks were not the ones I would have chosen among the nominees, but that's why there are loads of products . Something for everyone and the winners are great products just not all my favs. (All links next are to my earlier reviews). 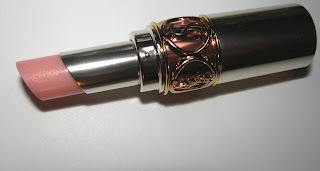 For my money no lipstick was better last year than the new version of Dior Rouge Dior . It didn't even make the finals nor did Clarin's Rouge Prodige . It's hard to imagine Fresh Sugar Plum Balm beat Chanel Rouge Coco and Tom Ford lipsticks in the finals but Chanel did win last year . Or that Fresh Brown Sugar Hand Cream beat Kiehl's Creme de Corps Soy Milk and Honey Whipped Body Butter. That stuff is amazing. I can highly recommend the Clinique Even Better , Shiseido Sunscreen ( and this category was packed with all winners , every item was awesome) and Cover Girl Liquiline Blast. And I like men's fragrance winner Chanel Bleu de Chanel. Here's a list of the winners , congratulations to them all. Any favorites of yours here or what would your choices be ? 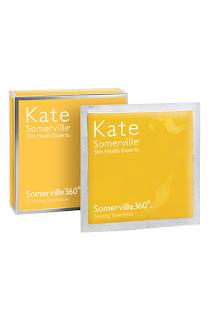 Kate Somerville's Tan Towelettes have been one of those things we've all seen on QVC many times as a big seller. Maybe you've bought them , a lot of people have. But not me. I now know the error of my ways. I use self tanners a lot, all summer really and into autumn. I have never really went much for the towel types until I tried the Somerville ones. I got one of the most even tans and the longest lasting tan ever. The self tan from these towelettes last easily twice as long as any other self tanner I've used. The Mom, even more into self tanning than I, tried one, and said to me did you notice how long these last ? The towellette itself is a good size and has a lot of product. You can easily cover all of you with one . I still made sure to really go over all areas and blend well with the towel overlapping any areas I thought might need it. Drying time was pretty fast and there was very little self tan odor. The tan was deep but not dark . Perfect for me as I want color, not just a tint. These are a bit more pricey than many other self tanning lines out there but I have to say with the extra wear time it can be worth it. I plan to keep some handy for those special occasion times or trips. 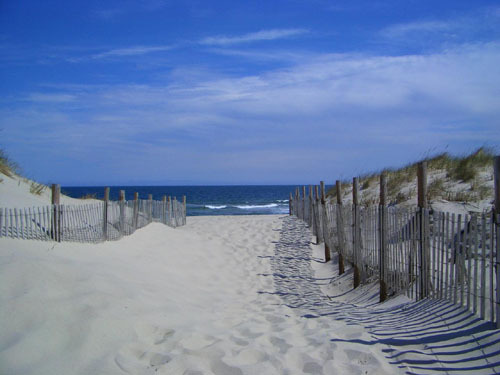 A pre short vacation use would mean your tan would last the whole trip depending on how much time you spent in water. But these are also very easily packed for a top up. A box of 8 individual towelettes is $ 48.00 or on the brands website you can buy one for $ 6.00. Summer is approaching and stockpiling on sunscreen is happening. Last week I did a whole post on sunscreen ingredients and how I would be looking for the best in physical sunblocks. New is Clarins UV Plus HP SPF 40 ( Note * this is a revamp of a previous product of almost the same name). 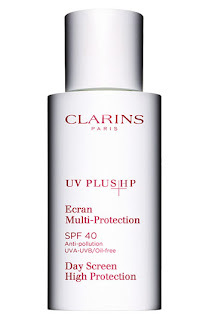 Last summer Clarins brought out the Bright Plus HP line and I used Bright Plus HP Intensive Serum and Bright Plus HP SPF 20 Day Lotion most days. They did a great job and were perfect for my oily skin. Serum at night, SPF for day. UV Plus is even better for oily skin. This goes on light, sinks in pretty fast and leaves skin matte with no white cast . This is one of the very few things I dare to use on my T- Zone. Obviously I need sunscreen there but I am loathe to use much beyond my matte foundation because it's so oily. I want SPF but not acne. The Clarins hasn't been an issue so far and has made a good makeup base. There is little moisture here and for me it's all I need. You may need to apply moisturizer over it . UV Plus is a physical block with 8.1 % titanuim dioxide, no oils and 100% mineral filters as well as Cantaloupe Melon Extract for antioxidant benefits. The bottle is a nice enough size ( 1.7 oz at $ 38.00) to last awhile. One might not make the whole summer but should go for a couple months. You don't need a lot of it as it blends out well. 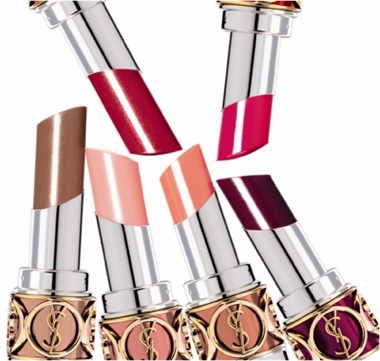 YSL Volupte Sheer Candy may be the silkiest , smoothest lippie you will ever try. It's really more of a balm, a glossy balm, and the sheerness of color reflects that. I haven't tried all the shades but have N. 3 Juicy Grapefruit and it's a super sheer, barely there pink with tiny shimmer. These are highly moisturizing with 35 % of ingredients being for lip care including hyaluronic acid. They are said to moisturize , plump and smooth. All I know is they feel wonderful and smell delicious . The mango scent is practically aromatherapeutic. There are 6 new shades in all , coming in a stunning silver case . Available for $ 30.00 at Sephora for May and all YSL locations in June. 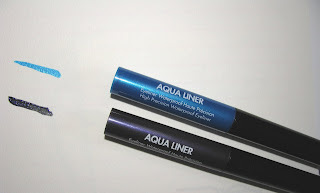 Make Up For Ever's new Aqua Liners are IT. These liners last as last all day, as in last even after you've washed your face you may find a trace still there last. (Having not used eye makeup remover beforehand in that case). You've heard me mention many times how few products last on my eyes. Even waterproof etc. These stay on , even on my very oily lids. The applicator is very tiny , precise and hard. 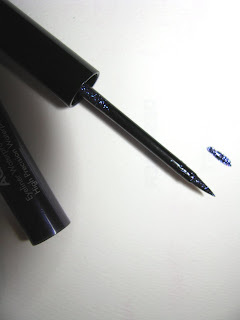 It's really easy to use and I am no liquid liner expert. They also come in a great color selection. From bright green to flat black. I have #5 Diamond Turquoise Blue and #7 Diamond Black Purple. The purple is a definite favorite. It's very dark, but still purple, or almost plum. The green shades are on my list. At The Makeup Show preview this weekend, makeup artist to Joan Jett and American Idol among others, as well as fun guy, James Vincent talked about how much he loved the new Aqua Liners. He got to test them before anyone else during Miami Fashion Week and had models in the pool water all day shooting with these liners and they didn't budge. Key ingredient is 50 % more polymers than other eyeliner formulations. 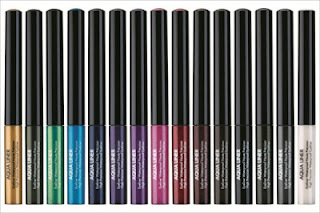 Make Up For Ever Aqua Liners are available now at Sephora for $ 23.00 and come in 15 shades. Saturday was the preview party for The Makeup Show NYC. It was one fun event. The highlight was meeting Dany Sanz and her and her team from Make Up For Ever doing full body paint on 3 models and making them into marionettes. They even brought in a marionette artist to conduct them. The painting was incredible , detailed and often looked like real clothes . Here is a clip I took of most of the performance. I wasn't super close but you still see most of it. 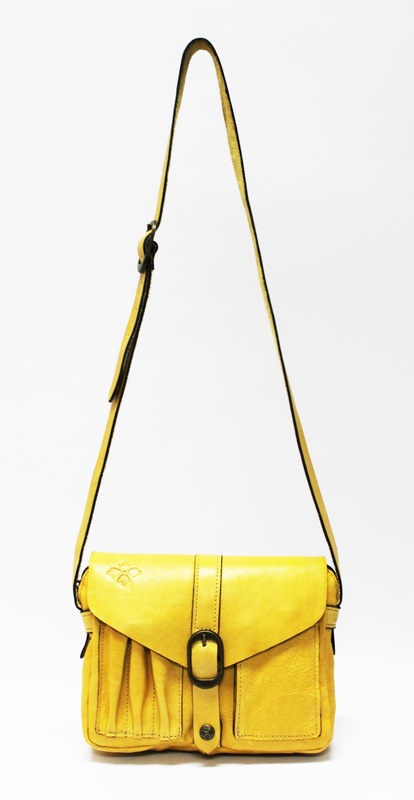 I have been loving a yellow bag for awhile , since last summer really but not yet bought one. 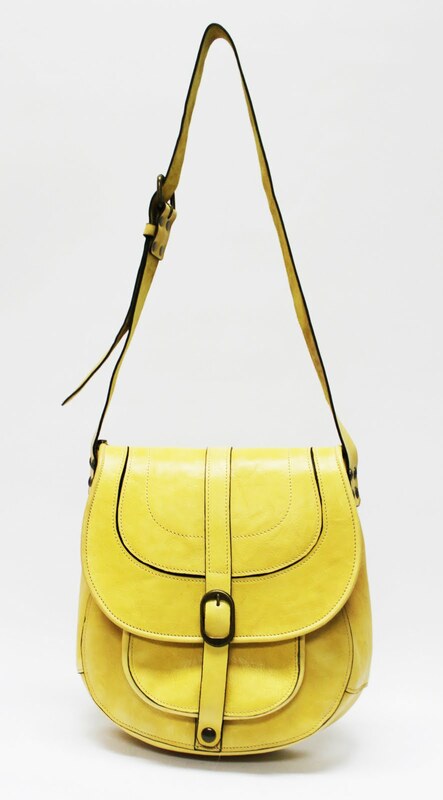 Yesterday I saw Evie-The Product Pasha in NYC and she had just bought a fab yellow Rebecca Minkoff bag at the sample sale that got me thinking yellow again. 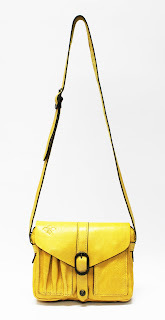 It's a big color again this season and these bags from Patricia Nash are not only nice but priced right, since leather has , like most things, gone up a lot. Off to the Makeup Show in New York today . Wanted to share , though, Kiehl's fundraising initiative in their stores today. 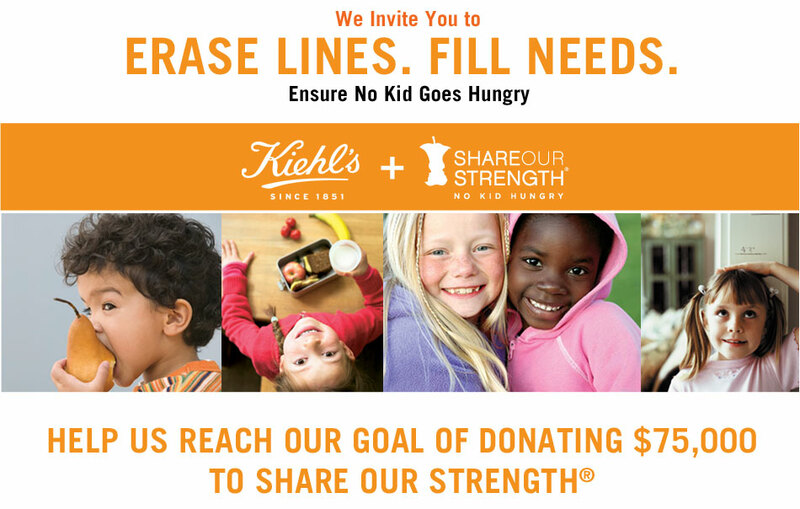 On May 14, 2011, Kiehl’s proudly unveils a national event called Erase Lines, Fill Needs, and Ensure That No Kid Goes Hungry in America. · If you’re unable to visit a freestanding store, donations will be accepted at Kiehls.com, May 14 through Dec. 31, 2011, to reach the total donation goal of $75,000. · In select stores, purchase treats from a bake sale hosted by Ambassadors of Share Our Strength to further raise funds for the organization. Gifts made to Share Our Strength represent a gift to our organizational mission and will be used to reach the highest number of children facing hunger in America. Share Our Strength does this by combining your gift with others to address child hunger community by community, state by state. Your gift today will leverage the time, expertise, and additional funds needed to end childhood hunger once and for all. And because we are an outstanding 501c3 organization, your gift is tax deductible. For summer Lancome has added two lovely scents as companions to it's longtime fragrance Ô de Lancome. The original Ô was created in 1969 and is a light chypre that is fresh, and green with hints of citrus. All of the Ô scents are meant to be "eaus", great to accommodate hot days with their freshness . The two new scents Ô d' Azur and Ô de L'Orangerie are more of this era and both have citrus at their hearts. Ô de Azur was actually released in Europe last year I believe, but is now on counters in the US. Ô d'Azur is is brimming with citrus ( and citrus that lasts long no less) but also has a feel of warm breezes with some light woods notes and a very light touch of rose . The top notes are Sicilian bergamot and Calabria lemon essence and are there right off as you spray. All the notes come together at the drydown though, so while the citrus lingers, it's not simply a lemon scent. Ô d' Azur lasts hours on me, staying fairly close to the skin but still giving off nice light sillage. Since I've gotten this I have worn it almost each day. As a citrus lover it's very me and the fact that I can get hours of wear makes it one I will reach for often. 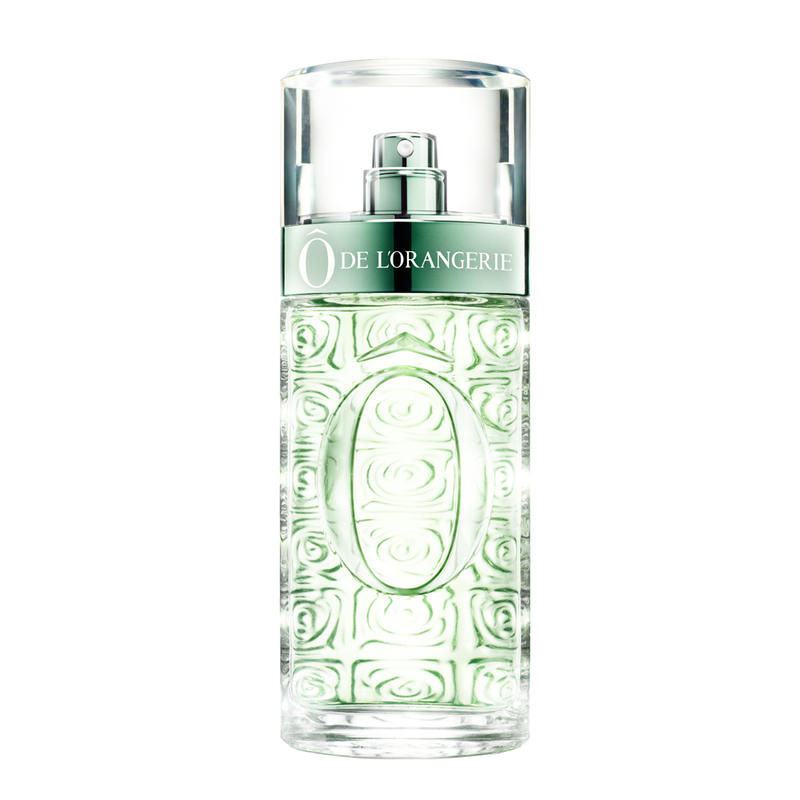 Ô de L'Orangerie is the newest and will officially launch in June as a limited edition. It's a very straightforward orange/orange blossom perfume and if those are notes you love , than you will love Ô de L'Orangerie. I have always been partial to orange blossom myself and find this to be as pretty as many of my other favorites. Beyond the orange zest , orange blossom essential oil and absolute, other notes are jasmine , cedar and benzoin. While those last two notes are there for grounding, they are not overly present. This is all about the sunny white floral that's just a tiny bit indolic and also a bit sweet. 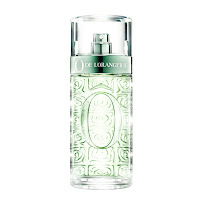 All the Ô de Lancome fragrances are $ 55.00 for 2.5 oz and come in a newly designed, very pretty bottle that has some reminiscence of the original Ô bottle. 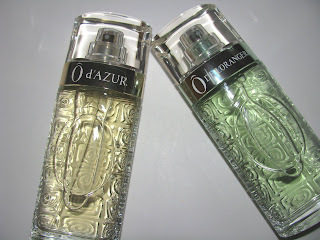 Ô de Lancome and Ô d' Azur are available now. 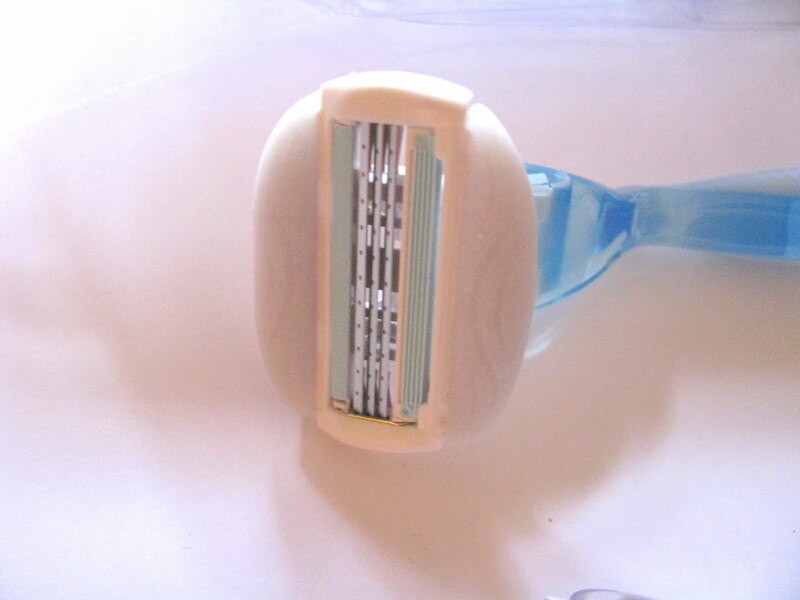 The new Venus Pro Skin is the kind of razor you can use without shaving cream . It gives you that much moisture due to it's "moisture rich" infused shave bars that surround the triple blade. 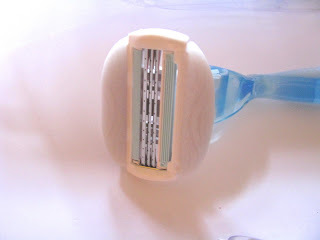 The shave isn't quite as close due to that moisture, but your legs feel but soothed and soft. never irritated ,. A bonus to the moisture shave bars - I have a feeling they'll be easier on self tanner wear than a more close shave. Venus Pro Skin also has a strong fresh scent, is lightweight in the hand, comes with 2 cartridges and shower hook. Available now at mass market outlets. You can find lots more info on shaving and Venus products at Goddess Central from Venus. 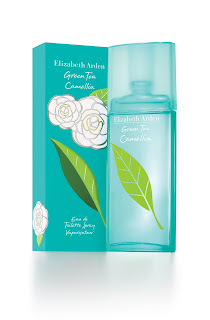 Elizabeth Arden has added two new scents to their longtime best selling Green Tea line . 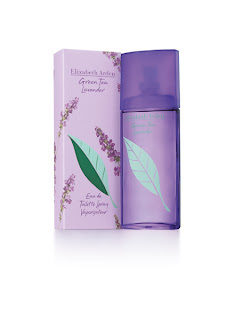 Green Tea Lavender is a blend of the name notes but gets a little musky mid way. After the long drydown however, it becomes this soft, lovely, light scent. Less green tea and a hint of lavender with light florals and no powder. Arden says this fragrance uses the " highest quality certified organic essential oils available, Givaudan’s Organic Lavender from Bulgaria" And that the "organic lavender used in this fragrance possesses a unique character with a very rich aromatic almost ambery note." It is very different from many lavenders I've tried and it's usually not my note . Green Tea Lavender on the other I really liked. Other notes are chamomile and Chinese Magnolia. Green Tea Camellia, inspired byJapanese Ikebana is mostly green tea , like the original ( if I recall correctly) but with a touch of light florals( it has notes of rose and peony and mandarin tree blossom ) and then dries down to a very light , subtle close to the skin scent. Each fragrance comes in 1.7 fl. oz. , $29.00 and 3.3 fl. oz., $39.00 and The Camellia also comes in a 1 oz size for $ 19.00. How cool is this ? 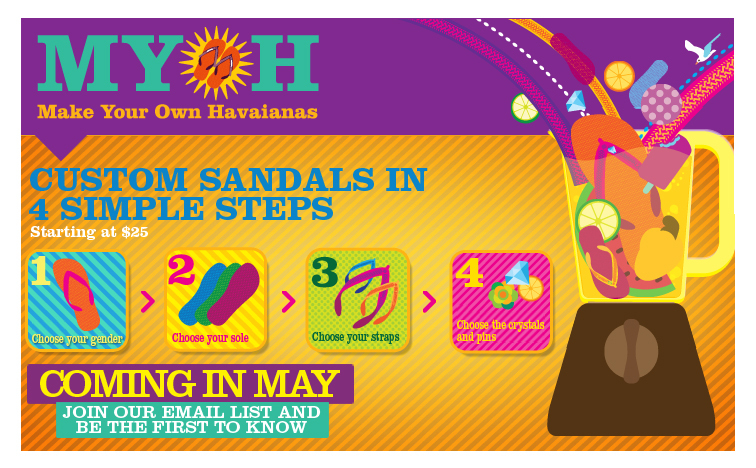 You can now custom design your own Havaianas. I love fun, unusual designs. I bought the Laura Mercier lip design ones a few years back and this year have my eye on the Matryoshka ones. I love anything Matryoshka themed and they even have a little gold doll charm on the straps. I have some plain pairs as well and hey , I love them but they're not my favs. Now we can design our own all the way. 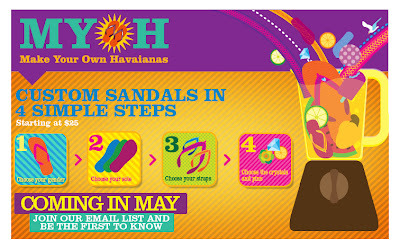 No details on prints or colors yet, but stay tuned to http://www.us.havaianas.com/ . With Mother's Day here what better way to celebrate Mom than by nominating her for the sixth annual L'Oreal 's Women of Worth award. Of course this isn't limited to moms but I know moms are major women of worth. My Mom is truly amazing every day. Nominations are accepted until June 30th. 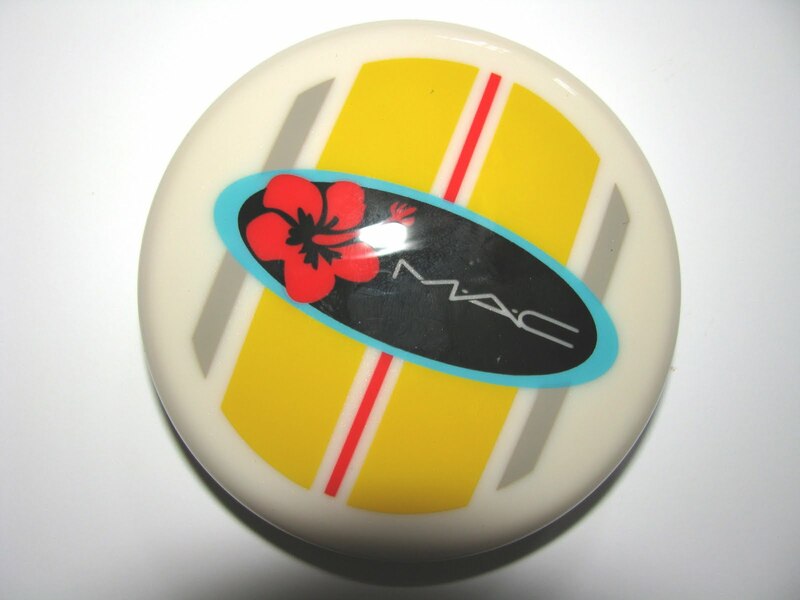 MAC summer is finally here. Always one of my favorites. Many nice products in Surf Baby but I was most anticpating the Skinsheen Bronzing Sticks ( along with the return of SunTints). 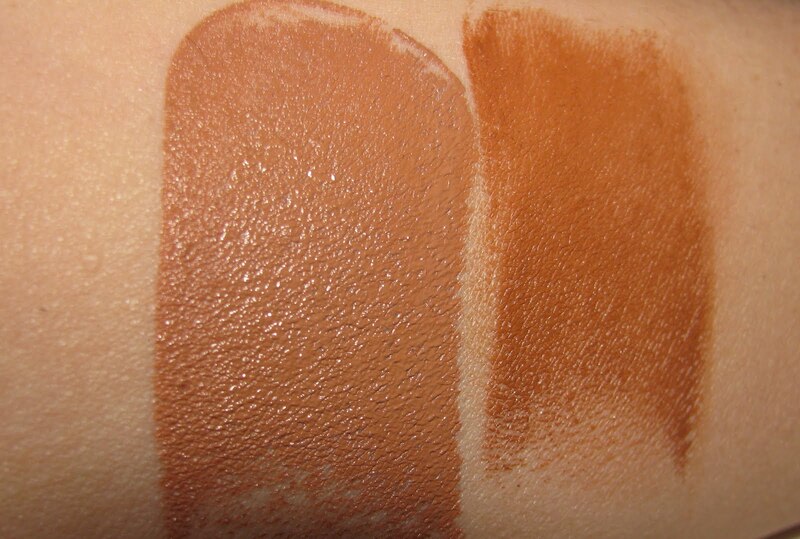 Skinsheen sticks are new , LE , and come in three shades. These are very dark as you can see by my image . The third shade I don't have but is darker yet per MAC's images. Shown left is Tan Tint and right is Billionaire Bronze. These blend well and down less dark, but they still are pretty deep. The pigment is rich, as is the formula. These are emollient and creamy, although no moisturizing ingredients are listed. They also really last and seem like they will hold up even underwater. Tan Tint , the lightest shade does work on my pale skin. (I am not super pale, but usually one shade darker than the palest in foundations. ) It looks a little deep on me but not bad, really . I do wish one thing, that these had shimmer. They are not matte but close. Overall I do like them and if you have a darker skintone then you will really win with these. They remind naturally of NARS Mulitples, but have a very different feel to them. At $ 29.50 they are also less expensive than Multiples. 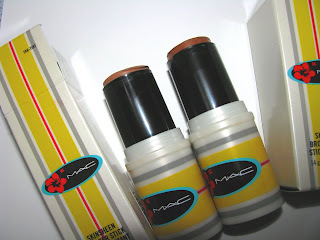 MAC Surf Baby along with Skinsheen Bronzing Sticks are on counter May 26. It's that time of year when we start to up our sunscreen use and for me to once again wonder why I can't get sunscreeen with both Mexoryls here in the US. Yes you can get a couple with Mexoryl SX, at a premium price, but none with both Mexoryl SX and XL. I've used Garnier Ambre Solaire for years thanks to a trip to France, and a friend in Australia. Mexoryl is regarded as one of the best sunscreens, far better than what we use here , it's inexpensive overseas and if thousands of europeans have used it safely for years, then whats the FDA's probem? They preach safe sun but keep us from the protectants that work best. ( Tinosorb is said to be another top notch , only europe ingredient). What I am only now reading is that not only is our sunscreens less effective, but many of the ingredients have the potential to be harmful to us. Hormone disrupting ( oxybenzone) or might actually make skin cancer more likely ( Vitamin A) . So what are we to do ? The obvious answer at this point is mineral -physical sunscreens. Zinc and Titanium Dioxide have no harmful efffect unless inhaled ( so I read at ewg.org) which brings me to powder SPF. I LOVE powder SPF since I am so oily and can up my SPF whenever I want. Now I read that inhaling zinc oxide is dangerous? Not on skin , only if inhaled. Ok. I am hoping using a sponge applicator will jump that hurdle because powder is my best option during the day after my initial application. To find out more I've been doing some research . 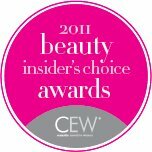 I've got part of what http://www.ewg.org/ has to say on ingredients and also went to Ron Robinson, founder of Beautystat.com and also a cosmetic chemist who worked for years at companies like Avon and Estee Lauder. Q1. Why can we not get both Mexoryls here in the US? If they’ve been good enough for Europe etc. for so long and are among the best , why do we not have them ? A. You can get it here in the US. ( Note he means SX) It's been available here since 2006. 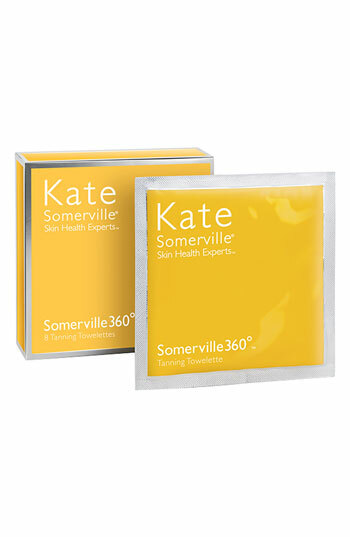 It is considered to be the most effective FDA approved organic filter designed to protect against short UVA rays. On XL he said "the XL has not been approved by the FDA yet, so it's not available in the US. It is available in Canada and the EU countries.It is supposed to provide effective protection against both short and long UVA rays. Q2. I’ve read that some sunscreen ingredients like Octisalate, oxybenzone and even Vitamin A can actually be harmful to us and our skin ? Is this true and do we need to worry about our sunscreen ingredients? Are there any chemicals we should avoid? Q3- You told me another time that sunscreens expire one year after opening. So basically even though they now have expiration dates, if opened that isn’t the case. It’s just one year ? A. I recommend you follow the expiration dates listed on the individual product. "Sunscreen makers and users in Europe have more options than in the United States. In Europe, sunscreen makers can select from among 27 chemicals for their formulations, compared to 17 in the U.S. Companies selling in Europe can add any of seven UVA filters to their products, but have a choice of only three when they market in the U.S. So where does that leave us ? I'd love to hear your thoughts, so please weigh in. I am also looking at as many sunscreens as I can, both new that fit the bill or ones already out there . For face, you can read about the newest from Skinceuticals here , a good light day moisturizer from Omorovicza and I have Clarins new UV Plus HP coming soon. For body there is also a SkinCeuticals with Mexoryl SX as well as Anthelios at drugstores. These will both cost you $ 25- 30.00. I have my eye one some new mineral/physical ones and will post as soon as I get info. 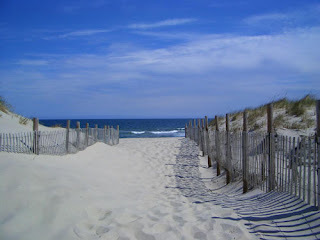 Image: Seaside Park, NJ via Seaside Park. I'm on the hunt for great sunscreens right now. Ones that work with my oily skin but give me good protection, preferably a physical block. New is SkinCeuticals Physical Fusion UV Defense SPF 50. I've used the Body Active UV Defense Sunscreen with Mexoryl before and know they make a good product. Physical Fusion this hits all the bells. Ingredients include 5 % zinc oxide (Z-COTE®) and 6 % titanium dioxide, as well as artemia salina, a plankton extract, to increase the skin’s defenses and resistance to UV and heat stress. It's not heavy, adds the tiniest bit of moisture, sinks in fast ( very fast, you need to blend fairly quickly) and has SPF 50 with no white residue. There is a barely there tint. Think of it as tinted moisturizer for oily skin, but minus most of the moisture. The finish ends up fairly matte and it makes a great makeup base . For me, this is all I need this time of year. And then use foundation on top of it . If you need more moisture, you can easily layer over it and if you are low maintenance, it's fine on it's own. Also, May is National Skin Cancer Awareness Month and SkinCeuticals is teaming up with the MRA (Melanoma Research Alliance) to fight Melanoma. SkinCeuticals is spreading the word on Facebook by asking users to post videos or written testimonials (i.e. how Melanoma has either affected them or someone they know) on the SkinCeuticals Facebook page. Starting May 2nd, SkinCeuticals will donate $20 to the MRA for every video uploaded and $2 for every post. Additionally, each user who uploads a video will receive a free full-size Physical Fusion UV Defense SPF 50. Chanel and Teen Vogue have am amazing contest going. If you win you get not only get to go to Paris, but to Coco Chanel's apartment and to see the Spring/Summer 2011 Chanel Ready To Wear show. "To celebrate the launch of Chanel Rouge Coco Shine Hydrating Sheer Lipshine, Teen Vogue readers will have the chance to win the trip of a lifetime – an all expenses paid trip to Paris with Chanel, including attendance at the Chanel Spring / Summer 2012 Ready-to-Wear show, a meeting with Creative Director for Chanel Makeup Peter Philips in his new makeup studio, and a private tour of Coco Chanel’s legendary Paris apartment at 31, rue Cambon. " Visit www.teenvogue.com/chanel for contest details and more information on how to enter. 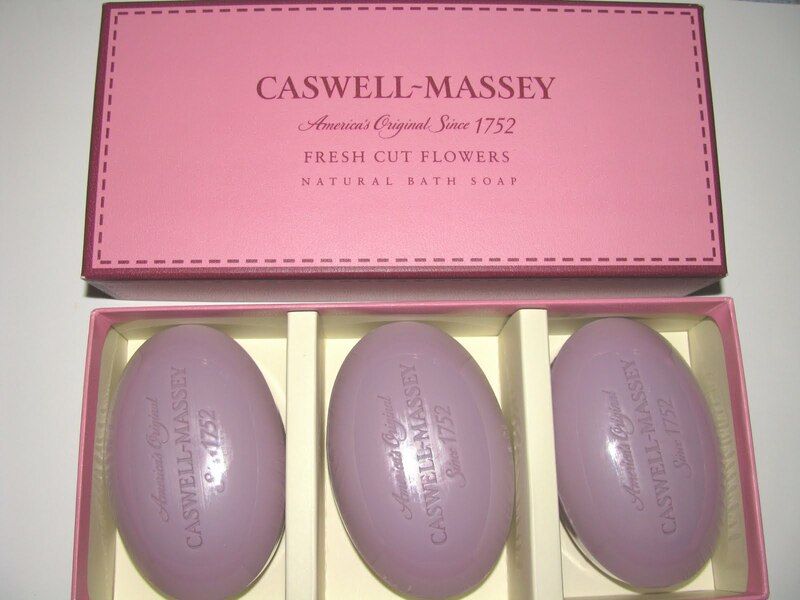 Luxury bath soaps are a special treat anytime. As it happens Mother's Day is almost here and they make a great gift for mom. Caswell-Massey has a new Naturals luxury line consisting of five new scents :Lemon Verbena, Lavender &Violet, Oatmeal, Fresh Cut Flowers and Ocean. The Natural line soaps all have ingredients of shea butter, glycerin, Vitamin E as well as an organic vegetable base and are free of parabens, phthalates, lauryl and laureth sulfates. The colors are derived from beet juice and plant chlorophyll. They are triple milled, very large and have strong scent. 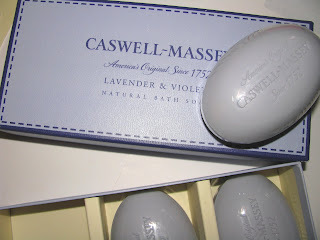 I've been using some as room scent , just left out with the wrapping still on and let me tell you they have throw. The two scents I've tried are Lavender-Violet which is soft, mainly lavender with a hint of woodsy violet, and Fresh Cut Flowers, a lush bouquet of tuberose, rose and green notes . Fresh Cut Flowers really smells like fresh flowers right out of the florist. It's my favorite. I am thinking the Lemon Verbena must be wonderful as well. 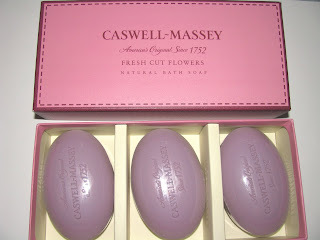 Caswell-Massey is available at http://www.caswellmassey.com/ and also at all Neiman Marcus stores. Vera Wang will be sending out her newest fragrance in August ( July in the UK). Called Lovestruck it will be fronted by Gossip Girl star Leighton Meester. No word on notes yet, but judeging from the bottle and ad, I think it's safe to say it will be floral. When Kate Middleton walked down the aisle Friday to become The Duchess of Cambridge she wore a lovely pair of diamond earrings. A gift from her parents, hers are oak leaves with a dangling acorn, though it's hard to see the details. Kate ( or her parents) chose wisely. The earring are just right for a wedding look. More than just a simple stud which would get lost and pale next to the dress and tiara, but not so big as to overtake the look from the face or dress. A little dangle and subtle flash. 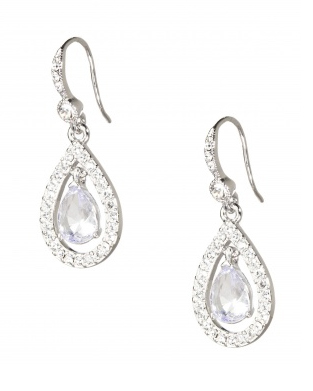 It's a look any bride can get and Carolee has the perfect pair. These earring have a small dangle and while not an acorn, a center pear shaped crystal stone. Just like Kate's, they are more than basic, but less than showy. What's nice is the price at $ 36.00 and knowing that you are buying a piece of jewelry that should last years. I have Carolee pieces dating back to the late 80s that look as new as ever. Some were very unique and large so not worn a lot, but other got more use. It's always been a line for quality and there is a wide selection that not just bridal but also for anyone looking for solid costume jewelry.